What Does Code P1310 Mean? 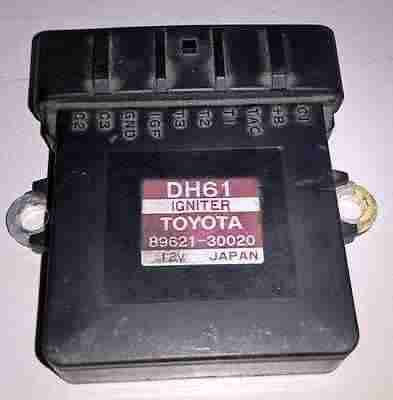 OBD II fault code P1310 is a manufacturer specific code that is defined by carmaker Toyota, and Lexus in particular, as “Igniter Circuit Malfunction No.3.” This code refers to a malfunction in the ignition system, with the malfunction being the lack of an IGF (Ignition Feedback) signal between the igniter (also known as an “ignition module”), and the PCM (Powertrain Control Module). “No.3” refers to the ignition circuit of cylinder #3. Engines that employ DIS (Direct Ignition) systems no longer have conventional rotating distributors to deliver ignition sparks to cylinders. Instead, these systems use signals from various engine sensors such as the Crankshaft Position Sensor, Camshaft Position Sensor and others to enable the PCM to calculate the optimal ignition timing for any given engine speed and load. Put simply, the igniter has replaced the conventional distributor in some ways, but with the advantage that ignition timing accuracy is vastly increased, high-voltage losses are greatly reduced, and component life is extended. In terms of operation, an igniter controls the primary ignition signal for all the cylinders it is connected to via an individual ignition coil and sparkplug for each cylinder. In practice, the PCM calculates the exact moment to deliver the primary ignition signal to the igniter for any given cylinder based on inputs from various engine sensors. The igniter “relays” this signal to the primary winding in the ignition coil for that cylinder, after which power transistors in the igniter interrupts the signal to create a high-voltage in the ignition coil’s secondary winding. This is the voltage that passes through the sparkplug to produce the spark that ignites the air/fuel mixture. However, the PCM needs to know that ignition in that cylinder had actually occurred, which is why the igniter generates an IGF (Ignition Feedback) signal after it had interrupted the primary signal. The PCM continuously monitors this feedback signal for all cylinders, and when it detects that the feedback signal from one or more cylinders is not being generated, it will disable the fuel injectors on affected cylinders to prevent damage to the catalytic converter(s), set code P1310, and illuminate a warning light. Note that on some applications, the ignition timing is advanced/retarded (relative to a base setting) by the igniter, while on others this function is performed by the PCM. In both cases though, the input data is derived from various engine sensors. The image below shows a typical Toyota/Lexus ignition igniter. Note the markings near the top edge of the frame that indicate the function of each wire in the connector, but be aware that the actual appearance of igniters varies between applications. What are the common causes of code P1310? What are the symptoms of code P1310? Other misfire related codes could be present along with P1310, with the most common being P0300, which indicates random or multiple misfires. Other possible codes could include P1300, P1305, P1315, P1320, P1325, P1330, and P1340, depending on the nature of the problem. How do you troubleshoot code P1310? SPECIAL NOTES: Code P1310 often appears soon after a vehicle had been serviced. When this happens, the cause is often nothing more serious than a connector that has not been engaged and locked properly, or a spark plug that has not been gapped correctly. However, the gaps on many types of spark plugs are fixed, and cannot, and should not be tampered with. Doing so could cause the sparkplug(s) to fail unexpectedly, so when this code appears soon after the vehicle had been serviced, be sure to check that all connections are tight, the gaps on all spark plug electrodes are as per specification, as well as that the correct spark plugs had been installed. END OF SPECIAL NOTES. NOTE #1: Code P1310 refers specifically to a malfunction in the igniter control/monitoring circuit, and NOT to a failure of or malfunction in any specific part or component within that circuit. However, igniter control circuits incorporate several components as parts of the circuit, and therefore, all components apart from wiring and connectors must be tested as well. NOTE #2: Diagnosing and repairing code P1310 correctly requires that the engine be in good mechanical condition. For instance, the compression on all cylinders should be within the range specified by the manufacturer, and the fuel injection system must be in perfect working order. If needs be, perform a cylinder compression test on all cylinders before starting a diagnostic procedure for P1310, but ensure that all fuel system related codes (if any are present) are resolved before performing the compression test to obtain the most accurate results. Note however that misfires caused by low compression will not necessarily set code P1310 or its related codes, but be aware that it is sometimes difficult to verify that P1310 (or related codes) had been successfully repaired when misfires due to other reasons are present. NOTE #3: Since diagnosing P1310 involves some pinpoint testing at various connectors, a pin-out diagram for the application being worked on is a required item, as is a proper repair manual and a good quality digital multimeter. An oscilloscope can also be useful, but is strictly not required. With the engine running at idle, wiggle all connectors that connect to the ignition coil on the affected cylinder(s). If the misfire disappears, check the connector for tightness or damage, and repair/replace as required. Defective ignition coils (also known as “pencil” coils) are a common cause of this code, so swap out the coil on the affected cylinder(s) with the coil(s) from other cylinders. If the misfire “moves” to the cylinder(s) that had good coils previously, simply replace the defective coils. Check the sparkplugs on all cylinders for damage, the presence of carbon deposits that could cause the plug to short out, oil fouling, and suitability for the application. Replace spark plugs that are not suitable, re-gap spark plugs as required, and repair the underlying cause(s) of oil and carbon fouling. NOTE/WARNING: The appearance of spark plugs is a valuable diagnostic aid, so if one or more spark plugs in an engine look markedly different from the others, it is possible that the affected spark plug(s) is/are not working as well as they should. However, testing a spark plug can be extremely dangerous, so always follow the directions in the manual on how to test spark plugs EXACTLY to avoid the distinct possibility of suffering serious personal injury, or even death. The safest way to test a suspect spark plug is still to replace it with a new plug, and we strongly urge non-professional mechanics to follow this route. In most cases, the ignition coil attached directly to the spark plug, with no intervening high-tension wire connecting them. Nonetheless, some older Toyota (and other) applications still have a wire for each plug, so swap out suspect plug leads with leads that are known to be good to test their function. Replace defective leads as a set, and only use OEM replacement parts for the best results. While this is not a foolproof method, check the internal resistance of all ignition coils as per the instructions in the manual. In some cases, the resistance of a coil can vary greatly from the specified value and still work perfectly, but any large deviation suggests that that coil is failing, or will fail in the near future. It can also happen that coils with resistances that deviate from specifications only break down when they are hot because their internal insulation might not be as perfect as it was when the coil was new. If all the steps outlined above fail to isolate or resolve the problem, consult the manual to determine the location of all components/connectors, as well as the color-coding, function, routing, and location of all associated wiring. Consult the manual and the pin-out chart to identify the IGT (Ignition Trigger) and IGF (Ignition Feedback) circuits for the affected cylinder, and check for open or short circuits between the coil connector and the E2 connector on the PCM. If no open of short circuits are found, check for resistance and continuity issues, and make repairs as required if deviations from specified values are found. NOTE: be sure to disconnect the wiring from the PCM before performing resistance and/or continuity checks to avoid damaging the controller. The image below shows the various connectors on a typical Lexus PCM. Note however that this image is intended for general informational purposes only, and that PCM connectors on various Toyota/Lexus applications may differ from this image. Always consult the manual to identify PCM connectors correctly. If no deviations are found, disconnect the connector at the ignition coil, and confirm the function of each wire in the connector before placing the multimeter probes on ANY wire or pin. In fact, the safest way to perform testing of this nature is to insert the probes into the connector from the back, so as to avoid the possibility of causing short circuits. Switch the ignition “ON”, and test the voltage in the wires (one at a time) between ground and the E2 connector at the PCM. If the measured voltage value falls between 4.5 V and 5.5 V, replace the igniter: if the measured voltage has any other value, replace the PCM in strict accordance with the instructions in the manual, and repeat the test. This step requires an assistant to crank the engine while you check the voltage between the PCM E2 connector and the ground of each IGT circuit. The purpose of this step is to check if the PCM is delivering trigger signals, so if the measured voltage does not fall in the range of 0.1 volts to 4.5 volts, replace the PCM in strict accordance with the instructions provided in the manual, before repeating this step. If the voltage measured in Step 5 falls within the specified range, disconnect all ignition coil connectors and measure the voltage between ground and the IGT circuit terminal of the PCM E2 connector. The voltage should also be between 0.1 volt and 4.5 volts. If the measured voltage value does not fall into this range, replace the PCM and repeat this step. If the voltage in the previous step checks out, disconnect the suspect coil connector and measure the voltage between ground and the #1 terminal in the connector. When the ignition is turned to both the “ON” and “START” positions, the measured voltage should be between 9 volts, and 14 volts- if it is not, repair the igniter power-source circuit as required. Repeat this test after repairs are complete to verify that the voltage in the circuit falls within the specified range. If no damaged to wiring, open, or short circuits are found in the igniter power-source circuit, check the power supply, and operation of the main Electronic Fuel Injection relay. Bear in mind that this step involves testing all the wiring between the ignition switch and the relay for ground connectivity, resistance, and continuity. 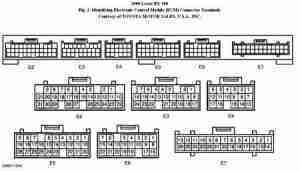 Consult the manual to determine the routing, color-coding, and function of each wire in this circuit, and compare all obtained readings with the values stated in the manual. Make repairs as required and repeat Step 7 to verify that repairs had been successful. NOTE: If the circuits between the ignition switch and the EFI relay checks out OK, replace the igniter, and retest the system to verify that the replacement igniter works as intended. P1300 – Relates to ““Igniter Circuit Malfunction No.1”, or sometimes as “Igniter Circuit Malfunction (Bank 1), in cases where each bank of cylinders is fitted with a separate igniter. P1305 – Relates to ““Igniter Circuit Malfunction No.2”, or sometimes as “Igniter Circuit Malfunction (Bank 2), in cases where each bank of cylinders is fitted with a separate igniter. None found. Ask a question about P1310. 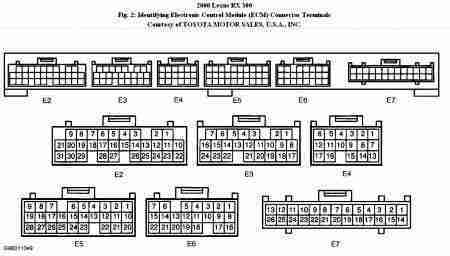 I have a P1310 code on a 2002 Prius. I have replaced spark plugs and all coils. The car will only start if the non primary battery is disconnected for a minute. The engine will then run for 30 seconds then shut down. I can check the green wire to the coil from the ECM, but would like to avoid that if there is another solution. Will you advise?